The Sarvoday Nagarik Sahakari Bank Ltd. , Himmatnagar has published Advertisement for below-mentioned Posts 2017. Other details like age limit, educational qualification, selection process, application fee and how to apply are given below. Educational Qualification: Graduate from recognised University, Basic computer Knowledge required. 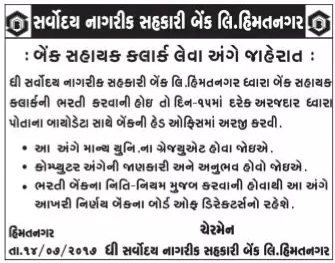 Address to sent Applications: The Sarvoday Nagarik Sahakari Bank Ltd. , D.V.P., Rd Number 5, Alkapuri Pologround, Mahavirnagar, Himmatnagar, Gujarat -383001.